Google has today updated their PageRank metric that is shown in the Google Toolbar. A number of my sites have moved up in rank, which is great. However the large amount of incoming links I have picked up for this site hasn’t made any change to my PageRank. I am still on PR4 which is a little strange in my opinion. I have other sites of mine which I don’t do any link building or content creation, and they have moved up to PR4 ?! 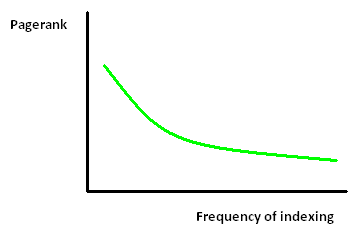 I put together this graph showing how PageRank impacts your site being indexed by Google. How did your websites go? Has your PageRank gone up?